Avocados Are Delicious And Healthy - Here's Why You Should Eat Them And 10 Ways To Enjoy Them! Do NOT fear their fat content. Avocados are good for you! Follow Foods For Long Life on FACEBOOK . What can be better news than to learn that avocados are good for you? So many people worry about avocado's fat content but that is one of the very things that make them a healthy food! Although most of the avocado's calories come from fat, it is good fat with unusual health benefits. * Much of the fat is classified as phytosterols which have significant anti-inflammatory properties and are known to decrease inflammation in conditions such as arthritis. * Avocados also contain PFA's (polyhydroxylated fatty alcohols) which also have anti-inflammatory properties. * The third healthy fat in an avocado is oleic acid - the same beneficial fat that is found in olive oil. This monosaturated fat is linked with reducing the risk of heart disease. It also increases the absorption of carotenoids. Let me tell you why I think that is extraordinarily important! Carotenoids are a class of powerful plant chemicals that found in many red, orange and yellow fruits and vegetables as well as dark green vegetables such as kale and spinach. Foods high in carotenoids can protect against cancers such as mouth, pharynx, larynx and lung. Previous studies did not show a correlation between the reduction of breast cancer and higher intake of carotenoids like: beta-carotene, alpha carotene, lycopene and lutein. However, when they measured the actual blood concentrations of these carotenoids, they found a 20 to 30% decreased risk of breast cancer among those women with the highest concentrations! Perhaps dietary intake was not a good indicator because even though women ate a lot of carotenoids, they may not have been absorbing them. But when you detect high blood levels you know for sure they were absorbing the carotenoids and those were the people who showed the reduced breast cancer risk. Since avocados significantly increase the absorption of these critical, cancer-protecting plant chemicals, I would suspect that eating these delicious fruits would be help lower the risk of breast cancer. Read more about this link between Carotenoids and Breast Cancer Prevention at the AICR website. And that's not all. Avocados are a good source of dietary fiber - one avocado providing 13.5 grams! They are also a good source of vitamin C, E, K, B6, folate and pantothenic acid as well as the mineral, potassium. My absolute favorite way to eat avocado is in a guacamole dip. Just mash up a ripe avocado, leaving some nice chunks, with some finely diced red onion, fresh cilantro, fresh lime juice, salt and cayenne pepper to taste. Avocados are a natural in salads. They go well with greens, tomatoes, beans, mangos, figs - you name it. And as I mentioned, adding avocado to carotenoid-rich fruits and vegetables significantly enhances their absorption. Salads containing one cup of avocado can increase the absorption of carotenoids by 200-400%! Raw soups are refreshing and fun to serve when the weather is warm. You'll need a good blender to make them. I use Avocados in raw soups to make them thick and creamy. Slather ripe avocado pulp or just place thin slices on an English muffin instead of dairy or non-dairy cream cheese. Or use it on sandwiches instead of mayonnaise. Avocados provide the same creamy texture as cream cheese and mayo and have much healthier fats. Avocados make the perfect addition to your morning breakfast salad. If you just eat fruit in the morning, you'll be hungry again in 30 minutes. If you add an avocado, and perhaps some nuts and seeds, you will have more energy and less hunger throughout the morning. Use diced or sliced avocado as a garnish on top of tacos and enchilada or as a filling in burritos instead of sour cream. The creamy texture complements spicy food very well and has a cooling effect on the tongue. I use diced avocados in just about every one of my salsa recipes. One of my favorites is Manila mango salsa. Just chop up an avocado and a manila mango and toss with a little fresh lime juice with jalapeño, red onion and cilantro. Baked potatoes get a bad wrap because of their popular unhealthy toppings such as butter, sour cream, bacon bits and cheddar cheese. But if you top them with tomato salsa and chopped avocados, they become a healthy dish. Especially because the fat in the avocado helps improve the absorption of the carotenoid, lutein, found in tomatoes! 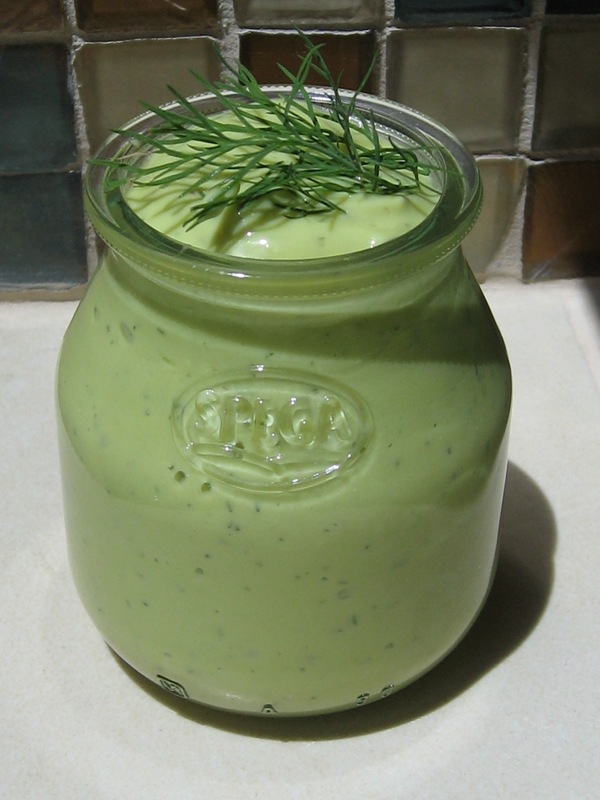 Blend an avocado in your favorite salad dressings and sauces instead of oil. It makes them thick and creamy. If they are too thick, you can add a touch of non dairy milk or water. To add some healthy fats and to give your fruit and veggie smoothies some "staying power", add some avocado. It will help the absorption of the lutein and zeaxanthin carotenoids when you have a "green smoothie" with kale. There are many other ways to enjoy this beautiful fruit but I just wanted to give you a few ideas. If you have others, please comment and share them with us! Dip steamed artichokes in this delicious, creamy dill sauce. Serve as an appetizer or in place of the salad course. I treasure the artichoke. Had I not grown up eating them, I probably would have no idea what to do with this thorny vegetable. But thankfully, artichokes have been a part of my life since I had enough teeth in my mouth to bite the delicious meat off of each succulent leaf. They are not only delicious but they are a very healthy food. One medium artichoke is only 64 calories yet has a whopping 10 grams of fiber! Artichokes have been shown to reduce cholesterol and stimulate the production of bile which helps in the digestion of fats. This wonderful vegetable also contains the flavonoid silymarin which protects the liver (and is also great for hangovers). Artichoke leaves also contain the phynutrients rutin, quercetin and gallic acid which all have powerful antioxidant properties. Fresh dill pairs perfectly with garlic, lemon and black pepper in this flavorful dip. By using a silken or soft tofu as a base, this creamy dill sauce is dairy and gluten free. Prepare the artichokes. Pull off any small leaves near the base of the artichoke. With a sharp knife, cut off the tops (about an inch or so). With a pair of scissors, cut off the thorny tips of the leaves. Trim thorny tips of leaves. If the artichokes are really big, (they seem to be growing them larger and larger lately) you can cut them in half, vertically. Most artichokes can be left whole. Trim the bottom of the stem or remove it, peel it, and cook it with the artichokes. Clean the artichokes by rinsing them under cold water. Place artichokes in a large pot with about 2 to 3 inches of water and a steamer basket. Bring to a boil, cover and cook until the outer leaves are tender and easy to remove. Add more hot water to the pot as needed as the cooking time could be as long as 45 minutes to an hour. Start testing outer leaves after 30 minutes. While the artichokes are cooking, prepare the dipping sauce. Place the remaining ingredients in a blender and process until smooth. This also makes a great salad dressing if you add a touch of extra virgin olive oil or cold pressed hempseed oil or, for a low fat dressing, use as is. Divide the sauce into 4 ramekins. Place each ramekin on a plate with one cooked artichoke and serve. For another presentation idea, remove all the cooked leaves and place them in a circle. Clean the artichoke bottom and place in the bottom of the ramekin. Place the ramekin in the center of the plate. Place the sauce over the artichoke bottom in the ramekin. When you are finished dipping the leaves, eat the bottom (which I consider the BEST part of the artichoke). Per serving: 128 calories, 4 g total fat, 0.5 g saturated fat, 288 mg omega-3 and 1,930 mg omega-6 fatty acids, 0 mg cholesterol, 10 g protein, 17 g carbohydrates, 11 g fiber and 371 mg sodium. Foods That Help Prevent Cataracts And Decrease Their Rate Of Progression - Recipe For Anti-Cataract Smoothie! If you have eyes, read this post! Even if your eyes are perfect right now, you should read this post. Why? Because the statistics on cataracts are shocking. * 50% of individuals 80 years and older have them. * 3 million cataract surgeries are performed each year. When the proteins in the lens of the eye are damaged, the lens can become cloudy making it difficult to read. Driving, especially at night, can also become difficult due to the increased sensitivity to light and glare. Vision can become blurred and clouded and the need for new eyeglass or contact lens prescriptions may be more frequent. This condition can eventually get bad enough to require surgery, a procedure where the natural lens is replaced and an artificial intraocular lens is implanted. Over ten years ago, during an eye exam, a doctor told me I was developing cataracts. I totally freaked out thinking I would soon be blind - and at such a young age (I was about 48 at the time). I probably developed these because, in my youth, I laid in the sun like a little salamander. I even smoked. But I didn't have any of the other risks such as diabetes, excess consumption of alcohol, family history of cataracts, high blood pressure, obesity or prolonged use of corticosteroids. I was, however, getting older and that certainly is a big risk factor. I immediately started researching natural cures. I couldn't just sit around and wait for my lenses to become opaque. And even though cataract surgery is pretty common with a 98% success rate, the thought of someone cutting into my eyeballs sent chills down my spine. The bad news is that once cataracts have formed, you can't get rid of them with diet but you can do a whole lot to prevent them or stop them in their tracks. But most doctors won't tell you that. Their advice is to wear sunglasses and stop driving at night. Gee, thanks. But you can do more. Studies have shown a link between antioxidant vitamins, such as vitamin C and vitamin E, and the prevention of cataracts as well as a decrease in their progression. In addition, the carotenoids lutein and zeaxanthin appear to have a protective effect. (In fact, lutein and zeaxanthin are the only two carotenoids found in the retina and lens of the eye). Research has linked the high consumption of foods rich in lutein and zeaxanthin with a reduced risk of cataracts. The RDA for vitamin C for women is 75 mg and it's 90 mg for men. If you smoke, add another 35 mg to the daily requirement. This vitamin is very easy to get from food. Fruits like guava, kiwi, papaya, strawberries, blueberries, lemons, oranges, and grapefruit are good sources of vitamin C as are vegetables such as bell peppers, mustard spinach, kale, broccoli, Brussels sprouts and tomatoes. The RDA for natural vitamin E, for adults, is 22 IU (15 mg). Vitamin E is a bit harder to get from food but the best sources are sunflower seeds, almonds, hazelnuts, wheat germ oil and avocado. Other sources include kiwi, dandelion greens, peppers, butternut squash and parsnips. Although there is no RDA for lutein and zeaxanthin, experts suggest that a minimum of 6 to 8 mg be consumed daily to achieve health benefits. 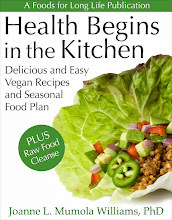 Getting sufficient lutein and zeaxanthin is easy if you eat your greens. A single cup of cooked or raw kale provides over 20 mg! Other great sources are spinach, collards and turnip greens. Broccoli, corn, peas, lettuce and Brussels sprouts also contain these critical carotenoids. But to increase their absorption, always eat them with some healthy fats such as cold-pressed flaxseed or hemp oil, extra virgin olive oil, raw nuts or avocados. Note: Although carrots are great for the eyes, I left them out of this smoothie because they are high in beta-carotene. Recent studies show that beta-carotene can interfere with the absorption of lutein and zeaxanthin. So if it's lutein and zeaxanthin you are after, it may be best not to consume vegetables high in beta-carotene in the same meal. This simple smoothie can give you your daily requirement of the antioxidant vitamins C and E and 20 mg of the critical carotenoids, lutein and zeaxanthin per serving. Blend all ingredients, except the flaxseed oil, in a high speed blender until smooth. Add flaxseed oil and blend briefly to combine. Per serving: 206 calories, 11 g total fat, 0.7 g saturated fat, 1,388 mg omega-3 and 2,513 omega-6 fatty acids, 0 mg cholesterol, 5 g protein, 26 g carbohydrates, 6 g dietary fiber and 203 mg sodium. It also provides 20 mg lutein/zeaxanthin, 97 mg vitamin C and 14 mg vitamin E.
Hemp, Almond Butter and Raisin Cookies - A Healthy Vegan And Gluten Free Treat Packed With Omega-3 And Very Low In Sugar! makes a great afternoon snack! * Made it vegan by replacing the egg with a flax egg. (This also added omega-3 and made them cholesterol free). * Reduced the sugar by 75% and added some stevia to make up for it. * Replaced the chocolate chips with raisins. The result was not only irresistibly delicious but each cookie has 563 mg of omega-3 fatty acids and a very favorable omega-6 to omega-3 ratio of 3.5 to 1 (anything less than 4 to1 is good). These beneficial omega-3 fats come from the power seeds, hemp and flax. And they are very low in sugar with only 1 tablespoon used in the entire recipe! You can reduce the sugar in any recipe by adding some stevia to compensate. Even if you don't like stevia, if you leave a bit of sugar in the recipe, you will can get the sweetness you desire with much less sugar and without noticing the stevia. Personally I love stevia but some people don't care for it as much as I do. I have an insulated cookie sheet that makes terrible cookies. Every time I try to use it, the cookies don't brown and never cook in the specified time. So if you are using one of these, you may have to extend the cooking time. These cookies have a much better texture if you use crunchy almond or peanut butter. Another tip for having success with this recipe is to stir up the nut butter to mix in the oils that are usually sitting on the top. The recipe is even better if you use a fresh jar because old almond and peanut butter can get hard and dry and won't make as good a cookie. This recipe makes 1 1/2 dozen cookies. Feel free to double it for 3 dozen. Make a flax egg by combining the ground flax seeds and water in a small cup. Beat with a fork until the mixture becomes gooey. Set aside. In a medium size bowl, mix the hemp seeds, sugar, stevia and baking soda. Stir in the chopped raisins until they are separated and coated. Add the nut butter and the flax egg and stir until well combined. Using a tablespoon or a small cookie scoop, drop tablespoons of batter onto an un-greased cookie sheet. Flatten with the back of a fork. Bake in the preheated oven until they firm up and brown slightly, about 13 minutes. Remove from the oven and let cool on the cookie sheet for 5 to 10 minutes. Move them to a serving plate and let cool completely. Enjoy! Per cookie: 75 calories, 6 g total fat, 0.6 g saturated fat, 563 mg omega-3 and 1,979 mg omega-6 fatty acids, 0 mg cholesterol, 3 g protein, 3 g carbohydrate, 0.5 g dietary fiber and 49 mg sodium.